Have you been watching the Olympics? They're pretty hard to avoid -- with the Games going on in Russia, 9 hours ahead of Central Time, it almost feels as if the coverage is 24/7, even though NBC is holding back its televised coverage for prime time. I've seen a few spoilers via social media, but am still enjoying the evening coverage (even with poor Bob Costas' pink eyes). I've found a few interesting Twitter accounts to follow, and a former college classmate has a cool blog that he updates as he experiences Sochi: Olympic Rings and Other Things. I've learned about twizzles in ice dancing, winced at crashes in the snow and on the ice, marveled at Russian skater Yulia Lipnitskaya's crazy-flexible spins, and so much more. It's hard not to empathize with the athletes and feel their joy when they succeed or their heartbreak when things don't go their way -- the cameras are right there documenting so many of these moments. It's part of the territory when you're an Olympic athlete -- you're on the world stage. 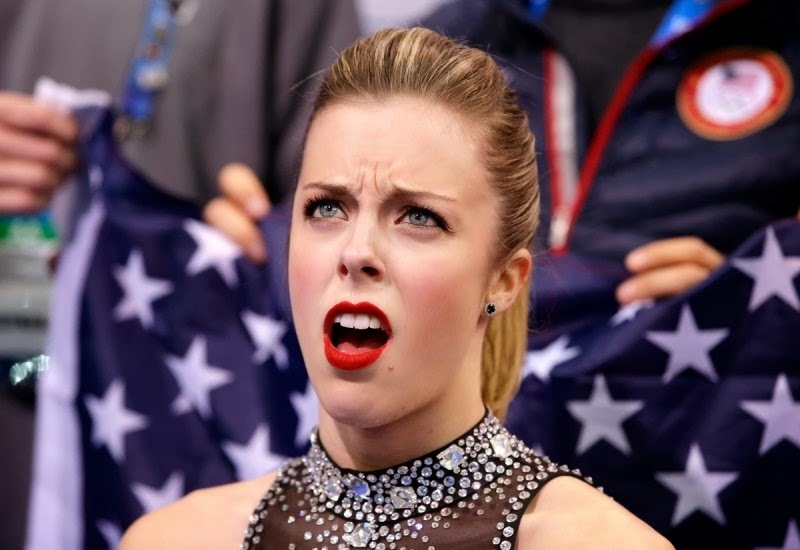 How about Ashley Wagner's reaction when her program score in the team figure skating event was posted? Poor sportsmanship. Sure, disappointment happens, but you smile -- or at least keep your game face on -- and move on. Keep moving forward (one of the best pieces of advice I ever had from a horse trainer that applies to anything in life). Participation in a scored event carries with it the acknowledgment that you're being judged -- and you may not always agree with the end result. Sometimes you'll feel the process is unfair, and other times you may get a 'gift' you may not feel you deserve. It may not always be possible to keep a 'poker face' -- especially under the glare of the Olympic spotlight -- but save the outright disgust for behind closed doors. Did you even hear about the Canadian coach who helped out a Russian skier who broke his ski in the cross-country sprint? Or that the Russian ski team helped out the German ski team when they ran into an equipment issue? Probably not. Let's put more focus on positive stories like those of Canadian brothers Alex and Frederic Bilodeau or U.S. biathlete Lanny Barnes. Those, to me, exemplify true Olympic spirit.